While I don’t know where I learned about Balsamic Syrup, or how to make it, I can recall the first time I made it. I didn’t tell BD that the chocolate looking drizzle on his ice cream was NOT chocolate. I was afraid if I told him I poured vinegar all over it, he wouldn’t have tried it. Now, I love to bake but sadly I never seem to have the time. A friend of mine reminded me of this recipe the other day and I thought it would be great to post here. This recipe is as common as how to make Béchamel, but I will post it anyway for easy reference. 1- The ratio is: 1 cup of BV to 2 tablespoons of sugar. 2- Add BV and sugar to a sauce pan and bring to a low boil over medium heat. 3- Stirring frequently, reduce by ¾. Once the syrup fully coats the back of a spoon – you’re done! 4- Remove from heat and allow cooling. How easy is that! The best part about Balsamic Syrup is it is so versatile. Put it on anything you want – fresh fruit, ice cream, cheesecake – sky is the limit. - It doesn’t smell fantastic while it’s boiling. Don’t let this detour you from trying it! - Use it sparingly on food. This syrup has some punch to it and by going heavy-handed with it, you may not be able to taste whatever you put it on. - if you don’t use it all, just keep it in the fridge. It will be fine for a while. Tonight I did one of my favorite little midweek desserts. I love this one because it’s easy and doesn’t take a lot of time. Plus for some reason, it just sounds decadent to me. 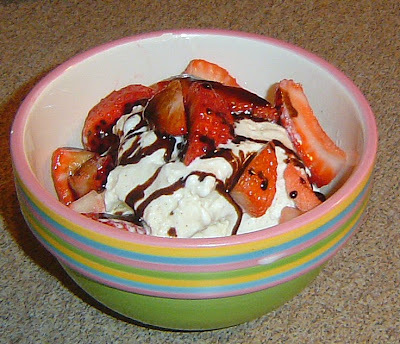 Vanilla bean ice cream with fresh strawberries and a balsamic syrup drizzle. I imagine myself sitting in a little sidewalk bistro on a summer night with a cool breeze as the waiter gives me the dessert specials for the night…. My thoughts on this dish: I love this. It doesn’t really make you feel like your being “bad” for eating ice cream. The creamy ice cream with sweet strawberries and the tangy, yet almost velvety-chocolate tasting balsamic syrup is simply heavenly. Everything balanced each other out, and at the same time highlighted the other ingredients. I made this tonight and I wasn’t even hungry but I said I would have a few bites. I ended up eating the whole bowl without thinking twice.